RIP my wallet. Black Friday was a big success for me this year. I managed to only pick out items either statement pieces or classics that will blend seamlessly with my closet. I spent all Thanksgiving with family, but was ready to hit the sales rack at 7:00 AM on Friday! I am excited to feature some of my favorite new pieces in the upcoming weeks! I have to restrain myself from wearing all of my new clothes right away. 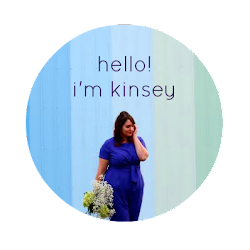 Time and a place, Kinsey. Time and a place. Anyone score any awesome deals today? I think almost every girl has a pair of basic black rights in her closet, but why limit yourself when you can get so many great looks with a pair of bright colored tights? A look back at some of my favorite looks with tights, both black and bright! They are they perfect way to extend your wardrobe and transition you from season to season. I always like to follow the personal wardrobe advice that tells you to splurge on classic items you'll want to wear forever and buy cheapy versions of trends you won't want to wear next year. Enter this jumpsuit. When jumpsuits were hot I was hesitant to jump on board. They seemed to be an item of clothing that only looked good on six foot tall waifs. 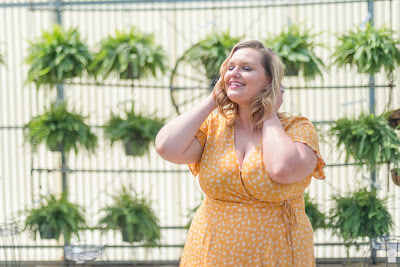 So when I found a jumpsuit I actually really liked and felt stylish in, I was happy to "invest" less than $30. The coat, on the other hand, was one of my first "adult splurges" when I was 22. I remember having a mini-panic attack when buying this wool coat but it has kept me warm and stylish for over six years now and looks just as good as the day I bought it. Any items you've gotten rid of over the years only to kick yourself when they become trendy again? I wore this recently for a "date day" with my husband. We kicked off the morning with a super romantic trip... to the vet. Taking my beloved felines for their annual check ups is the epitome of romance, no? Afterwards we hit our favorite new spot in town for some BBQ and moonshine cocktails. I knew we'd be running around all day, and I wanted to look both put together and comfortable. When I walked into our kitchen dressed and ready to go, my husband looked me up and down and announced that now he had to change to match my level of "dressiness". We tend to do this to each other. We get ready separately (separate bathrooms and closets are pretty sweet sometimes!) and when we get together to leave the house, it always turns out that one of us has "one upped" the other in the style department. It usually ends with one of us running back to the closet for a quick change before heading out the door. This is one of my favorite skirts. See how else I have styled it here and here! There is a whole lotta look going on here today. 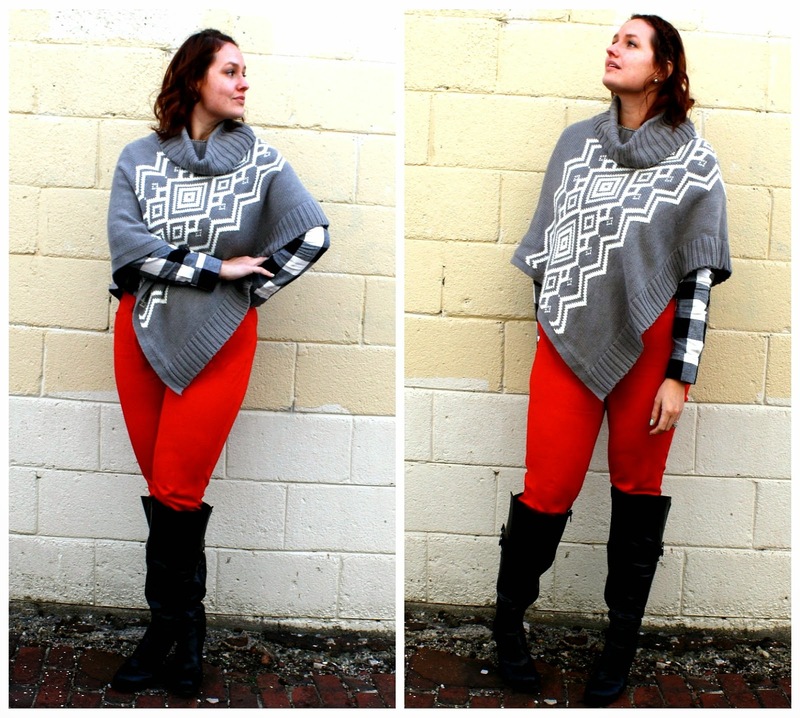 We have red trousers, a graphic knit poncho, a plaid flannel and knee high black leather boots. 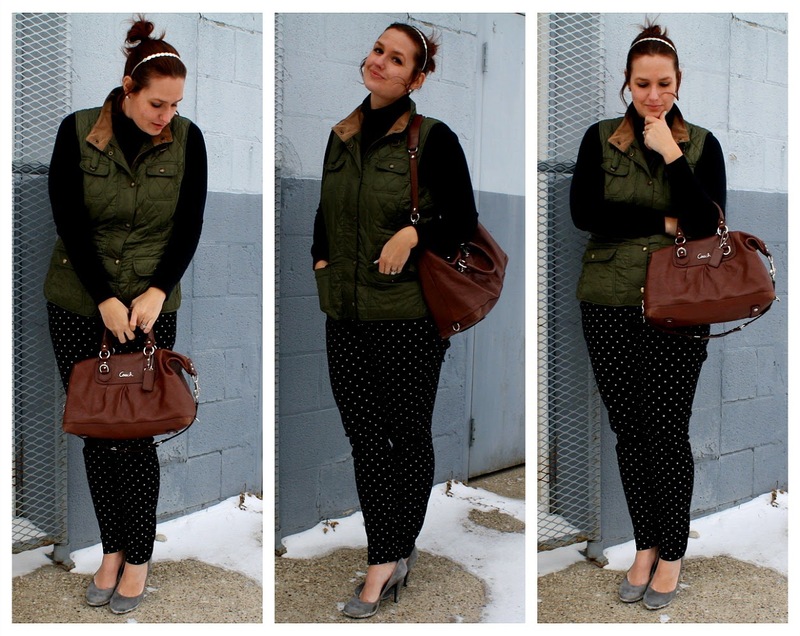 Any of these looks independently makes a statement, but put all together? Let's just say I ignored the "less is more" rule of style today. I have a few coat closets in my house, and I finally switched out my lightweight fall jackets and brought up my heavy duty winter coats for the winter. It's always a nice surprise each year, because my mind represses cold weather memories and it's like rediscovering new coats each year. 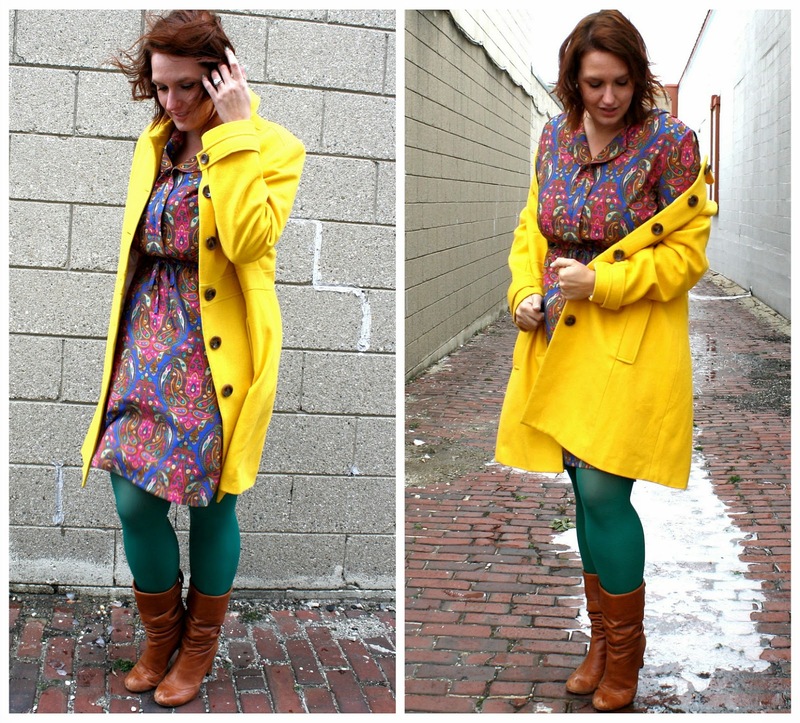 Like this warm yellow pea coat. I completely forgot I owned it. It wasn't until I was rummaging through my basement closet that I found it and started putting together outfit ideas. Can you believe something as bright and memorable as a Big Bird yellow coat could escape my mind? Well, now we are reunited and it feels so warm good! Do you ever forget about your seasonal wear? Guys! It is really cold! The weatherman seemed so sad as he told us it was the coldest November in nearly 55 years. If this is what I have to look forward to all winter, I better get used to numb fingers and tingly toes while taking my photos. Luckily, I had this cozy vest to keep me (sort of) warm. It is definitely a closet MVP, because I wear it almost once a week during the fall and winter. Last year during the Polar Vortex, I essentially lived in this vest. I'm getting major bang for my buck with this thing! What is your go-to cold weather essential?